Name the actor/actress that will portray you in the movie about you. Why is that a fit? Jennifer Aniston- She’s fun, smart, flirty, and very likable. Everyone enjoys watching her and she has a warm and inviting smile that lights up the whole room. She also has a confidence about her that makes her a very strong, independent kind of woman. We had the car for a few years before it became “my car” once I earned my license and I wouldn’t say it really described who I am besides the fact that I now drive a 2010 Hyundai Elantra that was brand new at the time I got it. I needed a new car for college since it’s a good 6 1/2 hour drive and so we traded in my 2001 for a new car. I was not planning on getting an Elantra again, but I test drove the 2010 and immediately fell in love. So I guess you could say I have a pretty good history with Elantras and that it’s the right car for me. I think it’s hard for anyone to narrow down to just one favorite song, but I do love a variety of music from the popular music of my age group, rap & hip hop, to some country that I have been growing fonder of. Rock and alternative has always been a favorite to listen to especially before my basketball games to get me in that ready-to-go mindset for the court. Well I wouldn’t trade places with a celebrity necessarily, but more of an athlete. 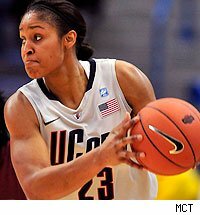 Maya Moore just finished her senior season with Connecticut’s Women’s Basketball Team after being one of the best players to ever walk their campus. Her talents and skills on the court are ones I’ve never seen before and she truly is a huge role model. It’s amazing to just be able to watch her play on TV, but over a year ago I had the opportunity to watch her in Dayton during tournament season. It was exactly what I thought it would be . . . unbelievable.